Can you see micro-churches are more effective than mega-churches? This is not a perfect model with no problems but an effective model creating more room to build quality fellowship and spirituality. 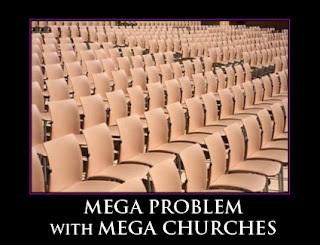 It is good if mega churches too would focus on small communities with quality fellowship during the week than just on large gathering for Sunday service. 2) I believe that our God is a God who looks for growth. We have to grow, personally and corporately. So a local church ought to believe in growing and make all efforts by God’s wisdom and power to grow. 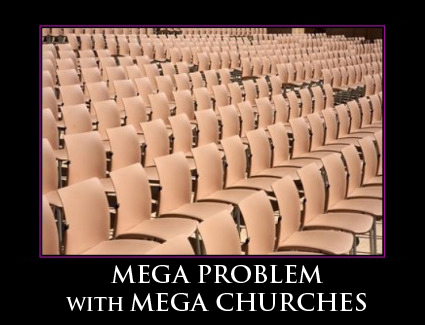 There is a terrible problem with any church that doesn’t grow in numbers. But as the church grows beyond its capacity to provide personal attention and discipleship to its members, instead of steadily growing in one locale like a huge banyan tree, it is good for her to split and multiply in other locales like banana trees. In this way, more leaders would be raised as the churches multiply, expanding God’s kingdom in a mighty way, than have just few leaders being confined to manage a mega church. 3) I believe, the leaders should make discipleship their passion, than church membership as their goal. They need to be making disciples to make other disciples, than just motivating one member of the church to bring other members to Sunday services. They should desire to see active growth of the church, not passive growth in which many members remain docile while only few being active. They must equip the saints for ministry, not just make them objects of ministry. The leaders should also focus more on strengthening the faith of believers than simply having a large crowd. They have to encourage believers and hold them accountable to have adequate personal and family devotions, making it their daily lifestyle, than simply have them listen to sermons Sunday after Sunday with no significant change in personal and family life. They must focus on raising obedient disciples for Christ, not mere church attendees. Finally, dear leaders, we need to be kingdom-centered, seeing how the kingdom of God can be expanded through evangelism, discipleship and church multiplication, than church-centered, focusing on just Sunday services and bringing people to church fellowship. Very encouraging, may our Lord further bless your ministry.